Lip Balm in a fun Banana flavor for some serious moisturizing any day, anytime. Help protect those lips! Lip loving oils of coconut and jojoba along with awesome mango butter are some of the natural ingredients in this Banana Lip Balm. It has a light color that will not color lips, so it's safe even for children to use. It is lightly sweetened to bring out the perfect banana flavor. Tuck into your purse or backpack. Get an extra one for your child, so you won't have to share. The recipe is nice and lightweight, so your lips won't feel greasy, just nice, moisturized and smooth. Comes in a swivel up tube. Use as often as needed. Each tube comes shrink wrapped for your protection. These lip balms would make cute party favors for weddings or baby showers, or buy a couple of extras to have on hand. 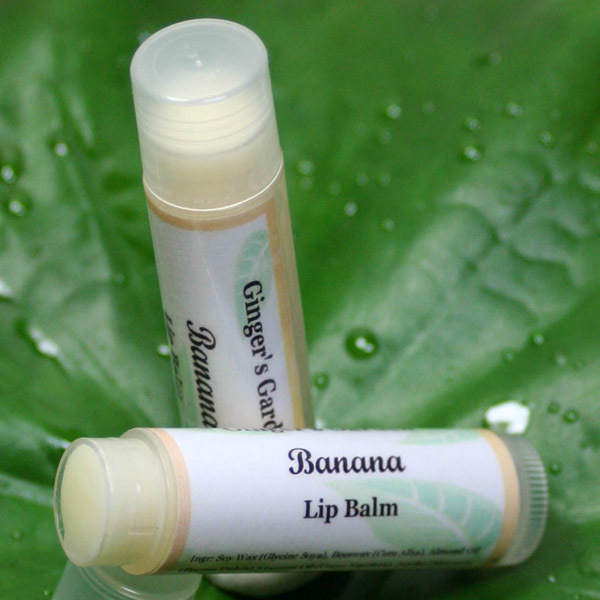 Banana lip balm is soothing, moisturizing and makes a unique welcome gift. Soy Wax (Glycine Soya), Beeswax (Cera Alba), Almond Oil (Prunus Dulcis), Coconut Oil (Cocos Nucifera), Jojoba (Simonsia Chinensis), Mango Butter (Mangifera Indica), Vit. E, Flavor, Sucralose, Mica.